Some people around HRM are frustrated with the service they’re getting from taxis. They say some taxis are picking and choosing their fares or denying service. In recent months customers say they have received inconsistent service from one taxi to the next. Natalie Tait, a young server at a pub in Halifax, says she has had unpleasant experiences trying to hail taxis in the downtown area. One busy evening she was out with a friend but getting a taxi to pick her up was difficult, she says. There were empty cabs driving by and stopping for her, but when she would say she wanted to pay with her debit card, the taxi would refuse her service and speed away. Brian Herman, operations manager for Casino Taxi, says it is definitely a contravention of their policy for a driver to deny service to someone because they are paying with debit, unless there is some sort of system outage with the debit service. Herman says taxi companies around the country charge the driver 5-10 per cent on each card transaction, but Casino doesn’t. Drivers at Casino, and at most companies in Nova Scotia, don’t lose any money by their passenger using a card. Casino Taxi is the largest company in the city and each taxi is equipped with a debit and credit card machine. The only difference between paying debit and cash is that the driver has to wait until the following Monday to get the cash from debit payments, says Herman. The Casino Taxi company also has a policy that restricts drivers from refusing service to a customer unless the driver feels their personal safety is at risk. There are 1,000 taxi owner licences in the three HRM taxi zones, with 610 just in Halifax, according to Kevin Hindle of the Halifax Taxi Commission. Elisha Gore says she was denied service from a Casino Taxi cab because of her destination. Before she got into the car she told the driver she was headed to Purcell’s Cove Road. “He told me that he couldn’t take me because it was out of the way for him and he’d lose money on the fares he’d be coming back around to,” she says. According to Hindle and HRM By-Law T-108 a licenced taxi has the right to refuse service only in the circumstance that the passenger is threatening and the driver fears or their safety, the passenger’s request would cause the driver to violate a bylaw or if the passenger doesn’t give proof of payment if asked. Kari-Anne Wellington, who works in downtown Halifax, says she got into a cab with a friend on Barrington Street one evening only to be kicked out of it moments later. Wellington says she and her friend were discussing which of their homes to go to when the cab pulled over. Wellington says she was mad because they were trying to get somewhere, but instead they got dropped off on the side of the road. “There is so much inconsistency in the cab world that you really hope for the best, but never get the same business twice. You just don’t,” she says. Wellington didn’t specify for which company the taxi driver worked. A Dartmouth resident, Melissa Boulanger, says she was on her way home one evening and got picked up at a Dartmouth bus station by a smaller Dartmouth taxi company. She says she must have been the taxi’s first fare because when they arrived at her apartment she tried to pay with a $50 bill, but the driver was unable to make change for her. Boulanger says that they went to two businesses before someone was able to break her bill. The meter in the taxi had been stopped since they first went to her apartment, she says. “I assumed that he’d assumed responsibility [for] not having the change for me,” says Boulanger. But when they got back to her destination the driver asked for four dollars more than the initial fare, she adds. She says that when she questioned paying the extra money the driver said he’d call the dispatcher and get the police involved if she didn’t want to pay, so she did. “I haven’t taken a cab since, I actually refuse,” says Boulanger. Yellow Cab, one of Halifax’s larger taxi companies, invites questions or feedback on their website. There is also a comment box on the main page of Casino Taxi’s website. Herman, of Casino Taxi, suggests that each time a passenger steps into a taxi they should take note of the number and the company. He says that when passengers call to complain some give vague descriptions, such as saying the cab was white, which doesn’t help identifying the driver when perhaps more than 100 of their taxis are white. “We rarely get a complaint with a quantifiable rooflight number,” says Herman. Hindle says that in 2012 the HRM Taxi Commission has received and investigated 26 complaints of a variety of different natures. Four complaints concerned vulgarity or rudeness, there was one complaint for refusal of service, six concerning fare disputes and five internal complaints about other taxi drivers. Hindle says that people with complaints “need to come forward with official statements” for legal action to be taken. If passengers want to voice their opinions they need to be aware and specific about the driver, company, and situation. Herman says he has seen the level of street level bylaw enforcement lessen over the years. He says bylaw officers provide little enforcement for taxis. Bylaw officers have given out only 17 tickets for taxi bylaw violations this year, says Hindle. Typically, says Hindle, a bylaw officer finishes his or her shift between 4 p.m. and 6 p.m., unless there’s a time that calls for extra enforcement. CAN’T smoke while you’re in their taxi. CAN refuse service based on zoning by-laws eg. 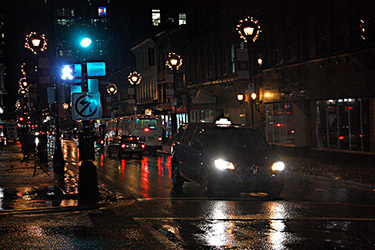 a Dartmouth registered taxi can’t pick-up in Halifax and drop-off in Halifax. CAN turn down a fare if the passenger’s request compromises the driver’s disability. Some of the complaints about cabdrivers are easy to remedy.Before getting into a cab note the name and number on the light,their there for a reason. If you are not treated with respect call in a complaint. Re: debit and credit cards,use at your own risk the drivers have lots of opportunity to retrive your information,the typical machines don’t record it but some drivers put their own in the car. When you get a minus bank balance or a high credir card balance don’t say you were’nt warned.